I'm a wino, and I'm not ashamed to admit it. I don't consider my evening meal complete unless I have something red, white, or pink thumped in my glass. For me, leaving off the wine is like leaving off the salt. Having firmly established myself to you as a overly particular diner who goes around most nights with a purple mouth, I never thought I would find a non-alcoholic drink that would ever satisfy me. NON-ALCOHOLIC! Can you imagine? Oh, I've had my flings with various juices, soft ciders, and spritzes, but none of them really seemed to go with the food. Enter Golden Star Tea. Yes, tea. Now, pairing food with tea is certainly not an original thought these days, but did I mention the bubbles? 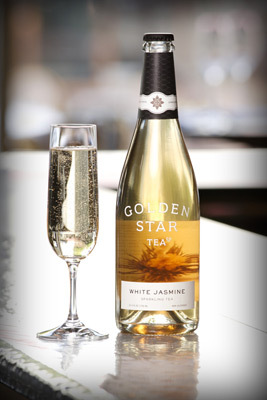 For Golden Star White Jasmine Tea is sparkling tea. Let me tell you, I have never met such a beverage. Sparkling ciders -- both grape and apple -- have never been dry enough for me. They're tasty and juicy but that's what they really are: juice. The sweetness that overwhelms these teetotalling options is not found in the limpid depths of a perfectly chilled flute of Golden Star. The uniquely refined sour flavor in Golden Star comes from the fermentation process, and though you might think the heady florals of jasmine might turn your tipple into Grandmother's eau de cologne, but it really doesn't. It's simply a remarkably balanced glass. It's simply a remarkable drink. Golden Star CEO and Creative Director Edward Carden explained to me that the company was formed with the idea of finally charting the fairly unexplored territory in the beverage universe: non-alcoholic luxury. Pair Golden Star with whatever you'd pair with champagne. Specifically, try it out on appetizers, leafy green salads, and seafood. Carden particularly recommends paring the tea with raw fish or any sort of seafood that carries with it that briny breath of the sea. You can even drink this glass of tea with desserts. Not as cloyingly sweet as a Sauternes or a port, Golden Star is a remarkably refreshing accompaniment to fruit desserts and cheeses. I'm champing at the bit to get my hot little hands on these bottles but as yet, Golden Star is only available at EOS wine bar in Cole Valley. Come September -- when we're still bound to be good and hot in the Bay Area -- Golden Star will make its way into stores. The 750 mL will sell for $12.95 and close on its heels, the 375 mL can be got for $6.95. Seeing that Golden Star took home two awards from the I'm not clearly not alone in my adoration. When you do frost your fridge with a few of these gilded bottles, serve in champagne flutes at 40° for optimum ecstasy. Go ahead, get bottle-greedy, for there will be no need for aspirin in the morning.